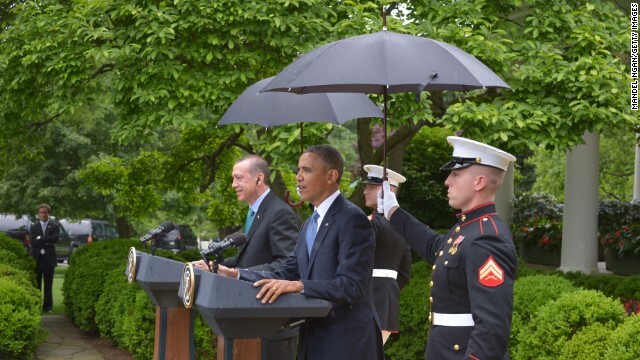 (CNN) – It's not a sight you'll see very often: two Marines holding umbrellas above President Barack Obama and Turkey's prime minister, Recep Tayyip Erdogan. After sprinkles turned into a steady shower of rain midway through his Rose Garden press conference, Obama called over two Marines to hold the umbrellas aloft. Regulations prohibit Marines from using umbrellas while in uniform. One reason: it makes it hard to salute. According to Marine Corps spokesman Capt. Greg Wolf, the sight of uniformed Marines holding umbrellas is "extremely rare" and only happened because the president needed it. And, of course, Obama is the commander-in-chief. If he orders Marines to hold umbrellas, they hold them, even if they can't properly salute. CNN Pentagon Producer Larry Shaughnessy contributed to this report. so easily solved without humiliating our marines in uniform.... take the thing inside! duh!!! i am beginning to see why this president can't fix anything in this country. "Speaking of geography skills, a recent poll showed that nearly 40% of those responding as "registered Republicans" claimed to have had heard quite a bit about the Benghazi scandal, but did not know what country it was in." If you can make stuff up, then so can I. But, it's really hard so there might be some truth to this. Polls taken within the first two weeks post election 2012 showed that more than half of voting Republicans believed Acorn contributed to Pres. Obama's landslide victory over Mitt Romney. @justsayin, why don't you ask the mouthpiece of the oversight committee, the car thief issa, about security at the embassies. The car thief VOTED AGAINST IT!!! I would say more Democrats wouldn't have a clue where Benghazi is located much less where Libya is that's right I gave them a clue bet they still got it wrong. question 5: in which country is Benghazi located? Back to the Marines again what a waste of tax dollars Obama should be holding the umbrellas for them. @just sayin, once again, take your head out of your behind. These are the facts. For FY 2013 the rethug controlled house voted to ONLY spend $1.934B for the State department worldwide security protection program. This was well below the $2.15B requested by the Obama administration. Hillary warned the repugz that it would be detrimental to national security just last year but it's all about keeping the black man down and darn the country! The problem with our news people is that they a bunch of headless morons who run with a story that is happening right now and have no idea or desire to investigate why. Your oversight car boy also voted for an amendment to cut $1.2B from state department operations. The lying altar boy also had a big hand on these cuts. If anyone should be on the hot seat it should be the car thief! What a sissified and arrogant weasel he is!!! Obama is an embarrassment!! You don't ask a Marine in uniform to hold your umbrella Mr President. Go get Axelrod to do that. The pettiness here is overwhelming, but expected from those who don't leave their basements. "And, of course, Obama is the commander-in-chief. If he orders Marines to hold umbrellas, they hold them, even if they can't properly salute." Actually, Marines obey lawful orders. If the order given, even from the Commander In Chief, conflicts with regulations, that would be an unlawful order, which no Marine, Soldier, Sailor or Airman is obligated to follow. "Regulations prohibit Marines from using umbrellas while in uniform." How horribly offensive and disrespectful of obama to ask Marines to hold an umbrella for him. Pathetic. But what would one expect from someone who called them the "Marine 'corpse' "??? The depth of this man disrespect for our finest is shameful. I keep hearing about how "smart" this guy is. In four + years, I've yet to see him do ANYTHING that would validate that claim. why couldn't one of the guys political aides hold the umbrellas? or somebody from the secret service? our men and women in the military should never be degraded like this and used like a cheap butler would be used. pathetic. My son is a Marine trained in security forces. They are trained to protect and SERVE. This includes even the smallest of details such as holding an umbrella for the president. Secret Service would not be used in this capacity, they would be the ones with the guns in this particular situation. Marine personnel that are used to protect the person of president are hand picked and they serve the president regardless of political party with honor and courage. And, since the funds were not appropriated by Congress and had been cut repeatedly since the GOP took control, there was no way the security could be increased. Stephens went on that mission himself because he felt it was important to go: I guess duty and honor mean nothing to you, but a death that benefits your politics does. As pointed out above and in Congressional testimony, your allegations are as false as Obama's claim to administrative transparency. At least try to have a little more integrity than a Washingtonian. I guess you still missed the part of the testimony where Chaffetz admitted he voted against the appropriation originally requested, stating that he " ...had to make hard choices." Try to at least put things in their proper context, unlike the Murdochbots. He's the commander-in-chief, Ed: I know that galls you, but he is the C-in-C. Not as big a waste of tax dollars as all the trips to Crawford, though. I find it truly appalling that U.S. Marines were asked to hold umbrellas for the President. As disciplined professionals that they are, they did what they were told and I have to wonder what they were thinking at that time. As a Marine, I would never hold an umbrella for anyone other than for a woman or the elderly. Next time the President needs an umbrella, someone needs to show some leadership and sense and put a WH staffer in their place. Our Marines are Warriors, not toy soldiers or servants! They deserve better and God help our beloved country. "Semper Fidelis"
@just askin: "so easily solved without humiliating our marines in uniform.... take the thing inside! duh!!! i am beginning to see why this president can't fix anything in this country." So extending a diplomatic courtesy to a visiting foreign dignitary (Turkey has played a strategic role in the Gulf wars) is somehow "humiliating to our marines"? Why do you liberals and Democrats keep lying? Obama's own person testified under oath that funding was not the issue. Their security was cut for political image reasons. I guess facts don't matter to you. Recall that Lamb is the person who denied requests from the top diplomatic security officer in Libya to retain a 16-man team of military personnel who had been protecting diplomats. Of the 33 "green" companies that have received loan guarantees from the stimulus, just three are in bankruptcy—including Solyndra, which could cost the government up to $535 million. (The other two firms are Abound Solar and Beacon Power, which is still operating and has largely repaid its federal loan.) Additional companies could eventually fail, but for now, the default rate is just 2.6 percent for one program in the stimulus. Congress created the 1705 loan program (the program that provided these funds) with the expectation that some companies would fail. The government was supposed to take risks. And (as energy analyst Gregory Kats has testified), the loan program’s final cost will likely end up WELL BELOW below the $2.47 billion Congress set aside to cover losses. @Ed1: "Back to the Marines again what a waste of tax dollars Obama should be holding the umbrellas for them." What's your opinion of the president on whose watch over 240 Marines died? (Hint: His initials are RWR). After the last ten days that Obama has had, the last thing he needed was an goofy looking picture of a Marine holding an umbrella for him. Obama's handlers should be terminated immediately. And fire Ron Ziegler......er, I meant Jay Carney, too. They are not doing their jobs. If he says drop and give me twenty, that's exactly what they will do. If he says I and our diplomatic guest need an umbrella held over heads, that's exactly what they will and did do. You would know nothing about that which is why you are where you are and they are there to serve their country, and their COMMANDER-IN-CHIEF. In regards to Bo's doodoo, pick up a book about the goings on in the White House and the "sevices" provided by Secret Service.